Alyson Beecher is actively involved in the children's literature community. She is a Program Support Specialist for the Pasadena Unified School District, and she was previously the principal at San Rafael Elementary School. Alyson is passionate about helping teachers and students understand the value of reading for learning as well as for pleasure. I admire the creative ways in which Alyson connects her students and teachers with authors. She knows how to organize a successful event and wears multiple hats. I invited her on Watch. Connect. Read. to discuss Bill Thomson's visit to her school. I wrote the words in red, and Alyson wrote the words in black. Thank you, Alyson! *I connect my students with authors and illustrators because so many of them would never meet an author if we didn’t connect via Skype or actual school visits. We are fortunate to be in an area with a lot of authors and illustrators and to also have the connections with bookstores that will arrange for authors and illustrators to come to the school. Children have been truly inspired by the authors and illustrators that they have met. Some have started to write stories when before they didn’t even want to write a paragraph. *A literacy cafe is a way that we bring books to life for students. They get to experience a book in a dynamic and relevant way that is education but also lots of fun. We have been fortunate to have several Special Edition Literacy Cafés including one with Bill Thomson. *Bill Thomson told my students that when creating a book with only pictures that every picture must be as interesting as you can make it. He then went on to talk about “vantage point” or “how you look at something”. “If I lay down on the ground like a worm and look up at you, you look like a giant.” - It was amazing to then watch a group of 1st to 5th graders working to draw pictures from various vantage points based on what Bill had shared with them. 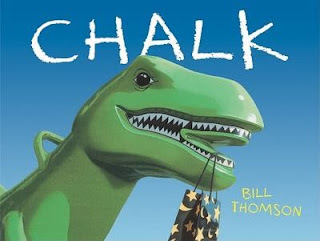 *Chalk is an amazing book that literally inspired a whole school community to celebrate literacy not only through classroom activities but also by having every classroom join together on the school’s sidewalks to re-enact the book through chalk drawings. It was truly magical. 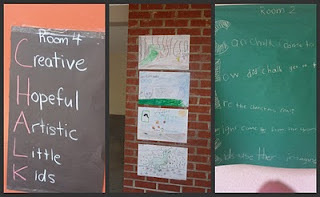 *My students think that Chalk is a magical book and that Bill Thomson is a very special person for taking time to visit us when he came out to Pasadena, CA in November 2011. * Mr. Schu, you should have asked me about how students’ attitudes about books and writing were changed after they experienced Chalk. One teacher told me that he had one student who had refused to write more than a sentence but after reading the book Chalk wrote out his only text for the whole book. Another teacher told me about a student who said he hated books but that Chalk was his favorite book. Another teacher told me about a student with limited oral language skills who through words re-told her the whole story of Chalk. Bill Thomson’s book is magical in more than one way. Click here to read more about this special day. Borrow Chalk from your school or public library. Whenever possible, please support independent bookshops. Thanks Mr. Schu for sharing our school visit with Bill Thomson with your readers. Thank you for sharing your experience and the videos. I use Chalk on the first day of school with my kindergarteners and then we too go outside and draw with chalk. This fosters a lot of conversations with new friends. Thank you for sharing your visit with us. I love the video clip and reading Bill's thoughts on vantage point. This is a first day read aloud in my K room and then we go outside and write with chalk ourselves.